This time of year is particularly meaningful because it showcases our deep commitment to teaching the whole child. By teaching the whole child we mean that we are curious about and committed to knowing child's whole story. There is no better representation of this commitment than Catlin Gabel Middle School conferences. Over four days, every family hears from all of the adults who work closely with their child highlighting their school work, social life, and emotional wellbeing. For us, this is a priceless opportunity to see each kid through the eyes of advisors, teachers, coaches, and parents who inevitably have unique perspectives on their strengths. With fresh eyes we can refine and tailor our approach for each child based on the actions steps and strategies that emerge. This is what most allows us to provide the best possible education. Teaching the whole child also means that we work toward ensuring all students get what they need to experience success in their academic, physical, social, and emotional lives. Recently I saw our efforts to do this when students sought out extra help from math teachers during lunch, science class when the teachers helped students reflect on their instincts for curiosity, PE when both teachers made a point of giving one-on-one feedback about kids' basketball techniques, theater auditions when students stepped out of their comfort zone to try something new on the stage, and C&C when advisors helped students organize their own winter potluck. These examples typify the wide net cast by our curriculum aimed at teaching the whole child. Less typical examples of this approach include our STEP projects in which kids flex their voices in co-designing experiences with their peers and teachers. The Universal Design group I've been working with, for example, has worked hard to organize presentations on their proposals to improve accessibility of our campus, and presented those proposals to people they'd only just met, residents of the Rose Villa senior retirement community. Also, kids are hard at work in their FAME project in World Cultures in which students not only learn about history and programming, but also have structured opportunities to practice leadership and collaboration. And, of course, there is “(Not) St. George and the Dragon,” our annual 8th grade holiday play, which helps students place themselves within the deep roots of Catlin Gabel traditions and gives them an opportunity to rewrite the play each year as an expression of their unique voice. Experiences like this give kids the chance to try out versions of themselves and, in the process, to discover a bit more about who they hope to become. In support of this adventure, the adults in this building know the children deeply. They look for students' strengths and build opportunities to leverage those strengths in the process of learning new skills, content, and habits of mind. This priority ensures that kids feel seen, heard, and loved, and serves as the foundation for their willingness to work hard, take risks, and enjoy participating in our community. 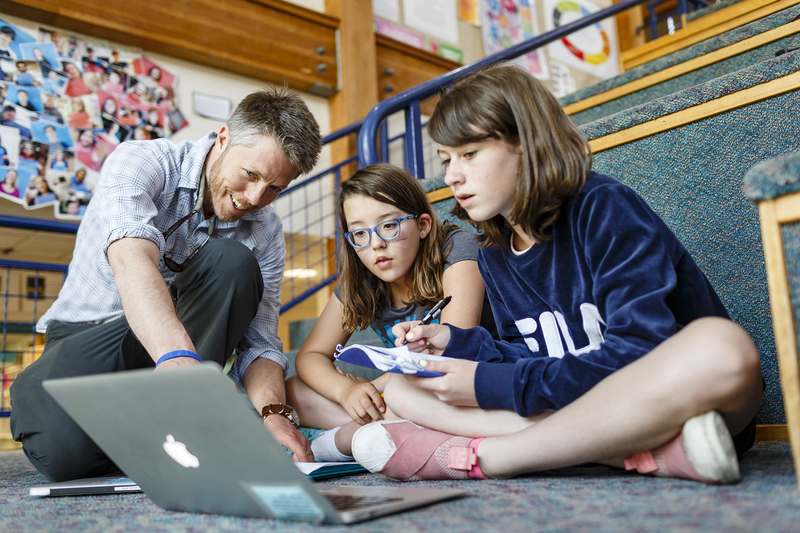 Pictured above: 7th Grade Science Teacher Jesse Lowes works with students in the Middle School Commons.